The Book of Miracles is a firsthand, inspiring account of the daily miracles of healing that have taken place at the Casa de Dom Inacio in the interior of Brazil. One of the world's most famous healers, Joao de Dues (John of God), cares for hundreds and sometimes thousands of people daily, usually at eh Casa and occasionally in other parts of Brazil. Over the past four decades he has treated millions of people! Numerous cures of cancer, AIDS, blindness, asthma, drug addiction and other physical problems as well as psychological and spiritual illnesses have occurred through his work. Joao does not take credit for these miracles. With true humility, he says he has never healed anyone, but that it is God who heals. 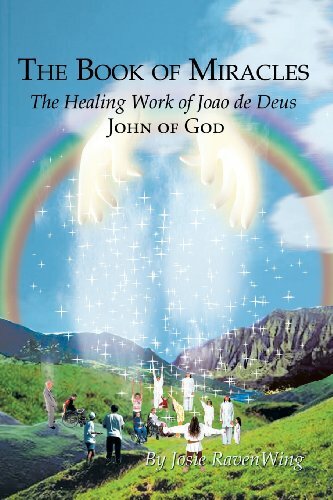 If this is the case, Joao is a singularly powerful medium of God's work and love and an invaluable resource for those seeking healing of body, mind or spirit. The luminous and breathtaking stories within this book will stretch the beliefs of some readers, affirm and deepen the faith of others. All will receive empowering information for their own personal healing. Author Josie RavenWing has one again succeeded in combining the practical and the mystical in this, her third and most exciting book yet!